I am usually disappointed in movies made from books I’ve read. Such disappointment is not inevitable, but the limited length of movies does make it difficult to reproduce all the subtleties of a substantial novel. Thursday night, I attended a special showing of The Fault in Our Stars sponsored by my church, St. Paul’s Episcopal Church in Mt. Lebanon. 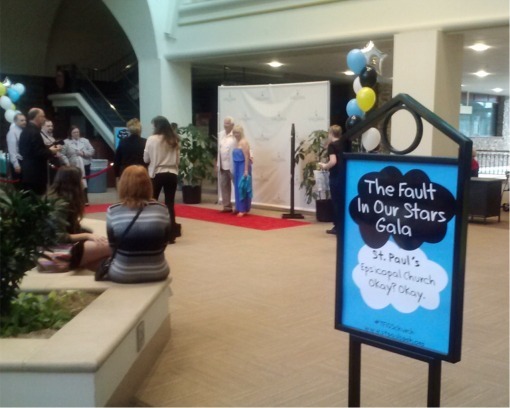 A number of scenes in the movie, which is based on the John Green young adult bestseller, were filmed at St. Paul’s. Knowing that I would be seeing the movie, I read the book two weeks ago. The Galleria Mall event was covered by the Pittsburgh Post-Gazette, KDKA-TV, and WTAE-TV. Wikipedia provides a good summary of the book here and offers information about the movie here. I won’t attempt to summarize the plot. I liked the movie, but I cannot say that I loved it. I can say the same about the book, which the movie follows closely. Hazel is a clever and unusually sensitive teenager who is concerned about her effect on others, even if her evaluations sometime miss the mark. Augustus is handsome and less cautious, and he is, for a teenager, especially respectful of Hazel’s needs. Both characters are preternaturally witty and sympathetic. Neither book nor movie is offensively sentimental, not another Love Story. The plot, or that part of it concerning Peter Van Houten, however, is a bit farfetched, though it is engaging. In any case, I am inclined to agree with the review on RogerEbert.com that contends that the movie—and one might argue, the book—“feels emotionally inert.” I did not cry at the end of the movie, and I am not above doing so in response to a particularly affecting film. (I wept uncontrollably after watching The China Syndrome, but many would consider that reaction weird.) Perhaps I did not feel devastated by the death of Augustus because narrator Hazel didn’t. As I said, the movie follows the book closely, which is not a criticism and which partially explains the film’s more than two-hour running time. This is reasonably long as movies go, but it did not seem excessively so. And this brings me to my main criticism of the movie. A number of elements of the book that provide the glue holding the plot together failed to make it to the screen, yet it seems that they could have been included without unduly increasing the movie’s length. In the film, it is never explained that Augustus originally stares at Hazel because she resembles a former girlfriend. Van Houten is independently wealthy, but this fact is, at best, implicit. In the book, Lidewij actually quits her job over the way Van Houten treats the teenagers, but her anger and tears didn’t effectively make it to the screen. Hazel’s mother, played by Laura Dern, perhaps my favorite character in the film, never explains that she was often doing schoolwork while waiting in the church parking lot for her daughter. And Hazel’s father, who cries a lot in the book, is a passionless spectator in the movie. I enjoyed the book, and I enjoyed the movie, but I suspect that I would have liked them a good deal less were it not for the connection to St. Paul’s. If looking for a movie to see this summer, however, you could do worse than choosing The Fault in Our Stars. Update, 6/9/2014. NPR’s David Edelstein has produced a helpful review of the movie, which you can read or listen to here.